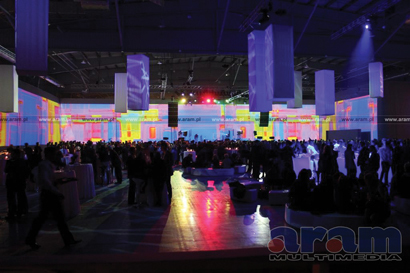 WARSAW, Poland – Aram Multimedia supported an event for DnB Nord bank with a projection spanning nearly 100 meters in length and covering an area close to 500 square meters in size. The projection required 11 projectors, two Catalyst Pro media servers and was controlled via a Barco/High End Systems Wholehog 3 console. Maciej Sobkowiak, CEO or Sound of Music agency, designed the set for the event.